For over 25 years, we have proudly helped our customers succeed. We have the knowledge, experience, and creativity to ensure your print goals are not only met, but exceeded every time. Whether you’re looking to print a publication, a poster, or a strategic plan, PrintWest and Mister Print can help you successfully realize your vision. Our extensive experience working with businesses of all sizes means we really understand the variety of print requirements in today’s market. We take the time to get know our customers and understand their business. As a result, we ensure the corporate image is consistently maintained and that all promotional programs achieve their goals. We utilize both traditional and modern technology, such as Print On Demand, to meet the needs of modern business. Above all else, we take pride in what we do…and it shows. As Saskatchewan’s Largest Printer, with 2 locations, one in Regina and the other in Saskatoon, PrintWest and Mister Print are leaders in the Western Canadian marketplace. Our head office and main sheet-fed plant is located in Regina, Saskatchewan. With a fully integrated utilization of the strengths of each division, we can provide everything for your printing or publishing project. We can help you with everything from printing your magazine, to providing your corporate stationary. When it comes to quality product and meeting deadlines, we are the printer of choice in Saskatchewan. Mister Print is a division of PrintWest and is located in Saskatoon, Saskatchewan. Mister Print offers you the best in quick print and digital printing capabilities. Our PW OnDemand online business stationery system functions out of the Mister Print location. PrintWest’s head office and main sheet fed plant is located in Regina, Saskatchewan. We are the printer of choice in the Saskatchewan market place for quality and meeting the customers deadlines. Mister Print is located in Saskatoon, Saskatchewan. Mister Print is a division of PrintWest which offers you the best in quick print, digital and wide format printing capabilities. Our PW OnDemand online business stationery system functions out of the Mister Print location. The Saskatoon Sales force works out of this office. We are one of Canada’s leading printers. Whatever you can imagine, we can print. Magazines, directories, newsletters, catalogues, journals, books, annual reports, stationery, and advertising products are just some of the projects we can successfully deliver. Our distribution department can assist you in your direct mail campaign. Look to us for your publication, neighborhood, personalized, or letter mail. Our digital equipment handles your variable data and short-run needs, our sheet-fed presses can handle small to large print runs, and our flexible bindery services can accommodate folding options, saddle-stitching, perfect binding, coil binding, tape binding, tabbing and more. State-of-the-art digital prepress services provide quick turnaround and seamless workflow on every job. You can send your Mac or PC files on disk or over the Internet using FTP. We excel with our wide format applications such as posters, banners, decals, signage and mounted prints. Let us help you draw attention to your business or bring new life to a room with some art work. We are committed to going beyond environmental regulations in such important areas as emissions control and sustainable forestry. We recycle our plates, paper and electronics. We are proud to have obtained FSC® Chain of Custody certification from the Rainforest Alliance. The trademark of the Forest Stewardship Council® indicates that the wood used to make the paper product comes from a forest that is well managed according to strict environmental, social and economic standards. The forest of origin has been independently inspected and evaluated according to the principles and criteria of forest management set forth by the FSC®. The Forest Stewardship Council is an international, independent, non-governmental, not for profit organization, whose membership comprises environmental groups, social groups, progressive forestry and wood retail companies working in partnership to improve forest management worldwide. We were the first FSC certified printer in Saskatchewan. 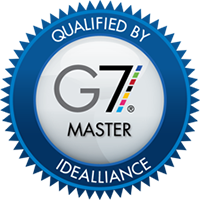 PrintWest is a proud qualified G7 Master Printer. This status is granted to printing plants that have qualified to use the G7 Proof-to-Print Process. The qualification was established with a G7 Certified Expert consultant from Fuji Film Canada and IDEAlliance, the non-profit industry association guiding print media methodologies, specifications and standards. G7 is an internationally accepted set of best practices for achieving consistent visual similarity across a range of proofing devices, presses and substrates. PrintWest, known for the quality of its colour reproduction in its sheetfed offset environment, utilizes G7 to provide output consistency across the entire range of its print services to customers.